BIG BILLION DAY- Minimum 50% - 80% Off plus Extra 20% Off on most of the top brands displayed on landing page. Many more discount on most of the brands. Limited period offer. 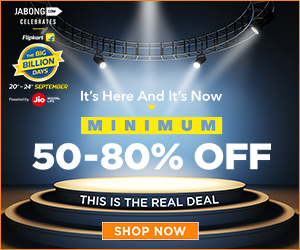 BIG BILLION DAY Mobikwik Offer- 10% Supercash (upto Rs 400) on minimum transaction of Rs1500 on Jabong via MobiKwik. Big Billion Day SBI Cashback Offer- Extra 10% cashback on a minimum purchase of Rs 2499 and on payment with SBI debit or credit card. No coupon code required. Offer valid sitewide on more than 2.5 lac products. Extra 20% Off on products displayed on landing page. No minimum purchase required. Offer valid on more than 1 lac products. Offer valid till 24th Sep only. Kids Fashion- Extra 15% Off on products displayed on landing page. No minimum purchase required. Offer valid till 24th Sep only. E Gift Voucher- Get your last minute gifts for your family and friends with just a couple of clicks. Flipkart gift cards can be used for purchases from sellers listed on flipkart.com. Card value can range from between Rs. 25 to Rs. 10,000. Order now and get 20% cashback up to Rs.100 on your first order. Flat 10% off on minimum grocery purchase of Rs. 2,499. Hotel at Flat Rs. 999, No minimum amount. Checkout date 31 March 2016. Get flat Rs. 150 off on orders of Rs. 1000 or more. Use the coupon code to avail this offer. Offer not valid on discounted products. Get flat 35% off on all Treebo properties. Maximum discount value is Rs. 300. Apply coupon code to avail this offer. Get flat Rs. 100 off on minimum purchase of Rs. 999 by using the coupon code. Please apply coupon in "Discount Coupon" box. Exclusive: Flat Rs. 250 cashback on flight or hotel bookings of Rs. 1000 or more. Offer is valid on bookings made through app only. Copyright © 2014 CouponMynt. All rights reserved.